Dance faculty and students have come together in creativity to create a magical evening of choreography that is sure to entertain when SUU’s Department of Theatre Arts and Dance presents Boundless Journeys: Student & Faculty Dance Concert, running November 8-10 and Nov. 12. This special concert showcases the work of both dance faculty and students in a diverse array of choreography, including Lise Mills restaging of the original choreography for Memories of Scotia created by Burch Mann for the American Folk Ballet. This popular work echoes the traditions of Scottish heritage. Another highlight, Unique Parcel, was created by Chien-Ying Wang, assistant professor of dance, who uses dance to celebrate the Generation Y, iGeneration and Google Generation. The work uses the music of Camille Saint-Saens and the artwork of local actor Dan Frezza. And Swerve, the vibrant work of Spring 2012 guest choreographer Lane Gifford, is inspired by the rippling and swirling patterns of starlings in flight and is revived and restaged by Paul C. Ocampo, associate professor of dance. On the student side of this semester's dance line-up, student choreographer Rebecca Boizelle has created Watchmen with music by Emel Mathouthi. This piece examines and explores the concept that when we build our outer defenses we often forget to strengthen what we're protecting inside. Heart of Dance was created by student Dustin Liechty, whose work was inspired by people struggling with breast cancer and its effects on family and friends. 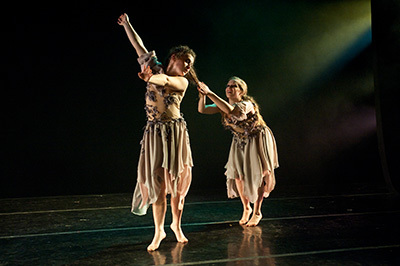 Beyond features the choreography of Katelin Ruzzamenti, with music by Helen Jane Long, depicts the memories that last forever, as do the shining stars above. Also, featuring music by Hans Zimmer, America, This is You has been created by Camille Bahoravitch, whose inspiration was based upon the idea that freedom isn't everything in this free American nation. Canflict, created by Ariel Hardesty, is influenced by poverty and its effects, and Jana Kim has devised a piece — Sing Me Away, featuring music by Julia Kent — in collaboration with SUU creative writing major Bob Durburow about the loss of time and innocence in the world. Eric LaRue Harperhad created Moment of Impact, a dance that centers on how a moment of impact has the ability to transform your life. And finally, What’s Inside is the creation of Alexandria Wall and focuses on remembering one's roots on the journey of individuality. With great purpose and inspiration, these students, their peers and mentors have all come together to create an unforgettable evening of dance in the Randall L. Jones Theatre. Dance ensembles in this semester's production include Carlie Anderson, Camille Bahoravitch, Kenzie Black, Rebecca Boizelle, Dalton Burr, Meagan Carson, Tiana Chambers, Heather Childs, Cameo Coburn, Kathleen Fatheringham, Abby Hall, Chandler Hall, Susan Hamilton, Ariel Hardesty, Ashley Herd, Erin Hulse, Sceri Ivers, Danikka Johnson, Mckenzie Jonley, Claire Julian, Kaitlyn Katter, Jana Kim, Leikin Knapton, Eric LaRue Harper, Dustin Liechty, Tiana Lund, Chelsea Moya, Emily O’Donnell, Megan Orton, Heidi Powell, Katelin Ruzzamenti, Shayla Slaymaker, Kayla Smith, Alexa Smoot, Beth Snarr, Kristen Stringham, Lauren Taggart, Carla Tomlinson, Amelia Valadez, Alexandria Wall, and Sterling Young. All performances begin at 7:30 p.m. General adult admission tickets ar $10; SUU faculty and staff tickets are $8; local student and youth tickets are $5; and SUU students are admitted free with a valid student I.D. Following this semester's capstone performance, SUU’s Theatre Arts and Dance Series continues with the holiday family favorite A Christmas Carol on the Air, CHICAGO the Musical, God of Carnage and Women of Lockerbie, all in the coming months of the 2012-13 academic year. For now, enjoy the thrill of dance by attending Boundless Journeys. For tickets, call the ticket office at 435-586-7872, or order online at suu.edu/arts. The Southern Utah University College of Performing and Visual Arts is comprised of nationally accredited departments of Art and Design, Music, Theatre Arts and Dance, as well as a graduate program in Arts Administration and a new Center for Shakespeare Studies. The College offers 16 different degree areas, including liberal arts Bachelor of Arts and Bachelor of Science degrees; professional Bachelor of Music and Bachelor of Fine Arts in art and theatre degrees; and a Master of Fine Arts in Arts Administration degree. More than 60 full- and part-time faculty and staff are engaged in teaching and mentoring over 550 majors in the College. Over 1100 students enroll each year in over 195 arts classes on the SUU campus. The College presents 100 performances, lectures, presentations, and exhibitions each year. The College’s affiliate organizations include the Braithwaite Fine Arts Gallery, American Folk Ballet, Utah Shakespeare Festival, and the SUU Ballroom Dance Company.